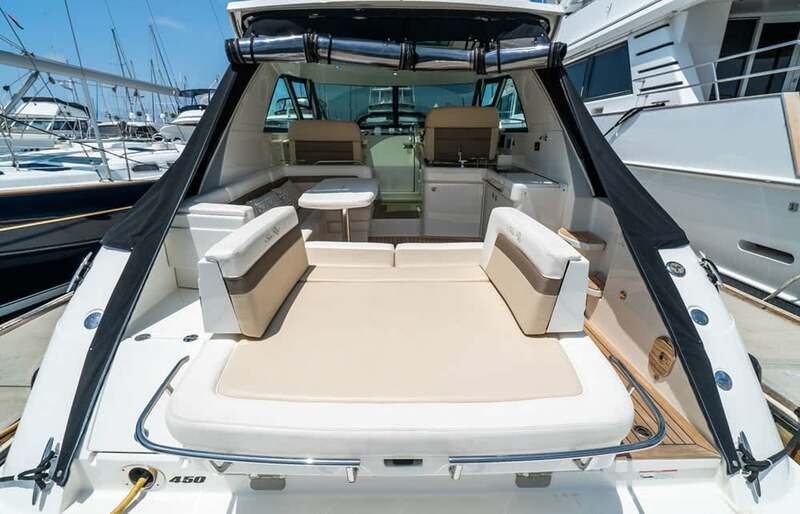 Pinnacle’s Sea Ray 450 is the most exquisite power yacht in the Pinnacle Fleet. She is absolutely stunning with a black hull, retractable cockpit hardtop, teak cockpit deck and walnut interior. The yacht is powered by twin Cummins diesel engines and state-of-the-art pod drives. Her visual splendor is perfectly complemented by her superb performance. Pinnacle is thrilled to provide this spectacular yacht to our most fortunate Members in Chicago. At about 47 feet in length overall with a 14.5 foot beam, this is a large yacht that can accommodate twelve people comfortably. 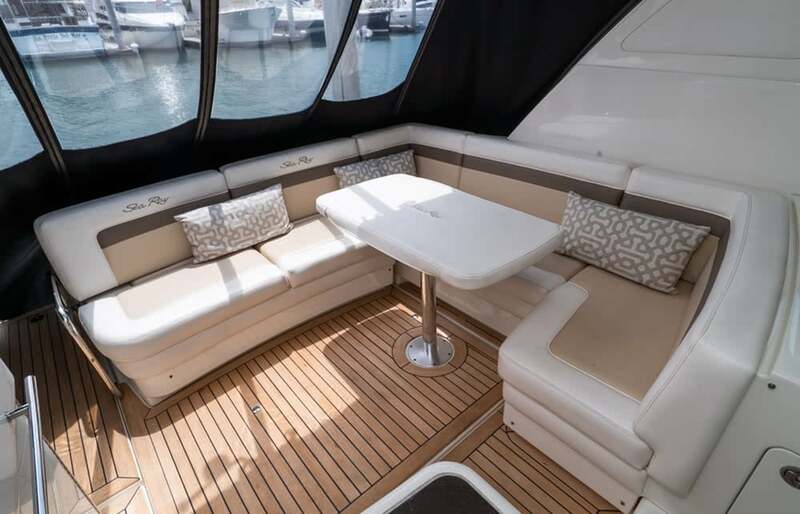 The aft deck opens to an elevated sun pad which flows onto a huge swim platform. 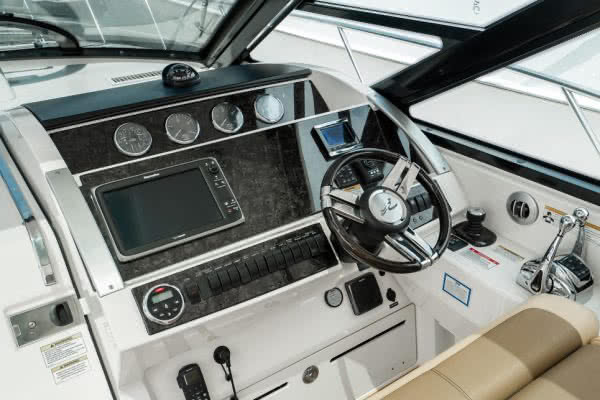 The deck forward of the helm is very large and inviting as a place to feel the breeze. The entertainment areas of the vessel are extensive and designed to accommodate large parties together on the same level of the yacht. 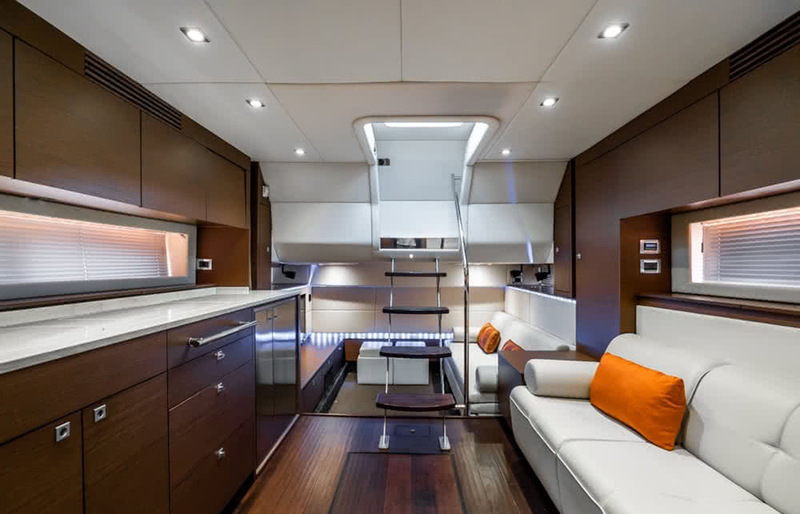 The interior of the yacht is gorgeous. There is a master stateroom suite forward with a luxurious bed, private head, private shower stall and television. This entire mater suite is separated from the main salon by a solid wood door. 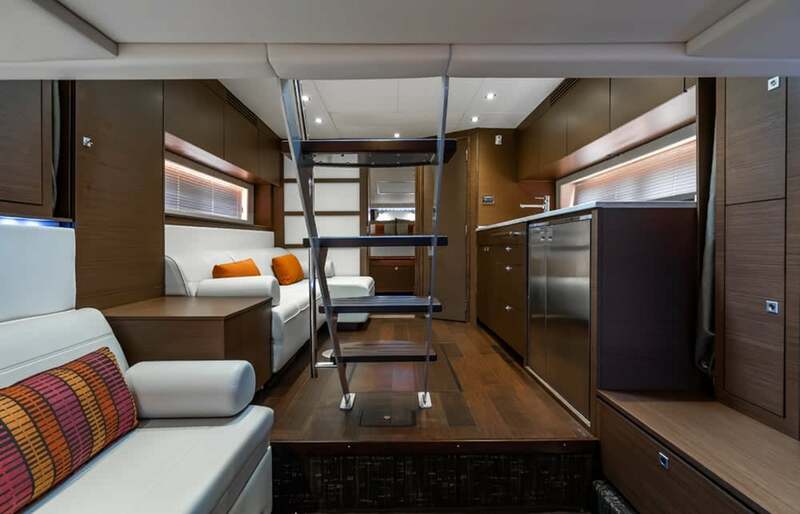 The main salon is elegant with a large galley, seating area and dining table. 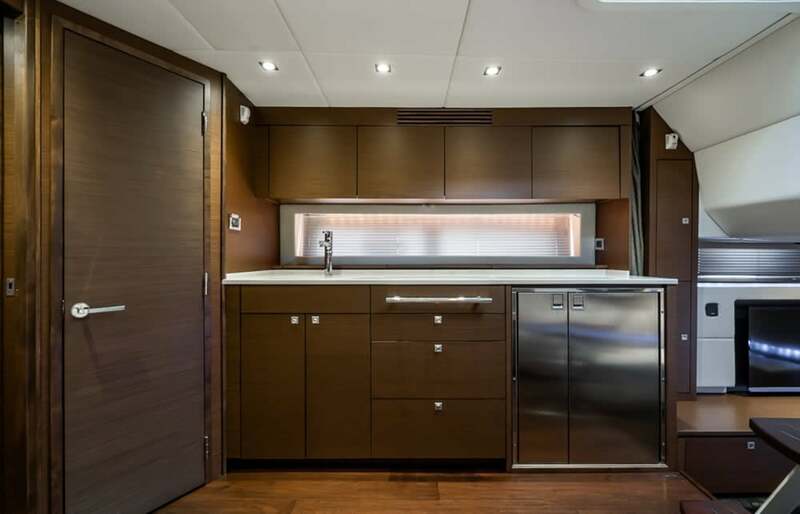 The galley has a two-burner stove, microwave, 120v refrigerator and double sink with hot and cold pressure water. It is generously equipped with quality wine glasses, plates, silverware, cookware and utensils. 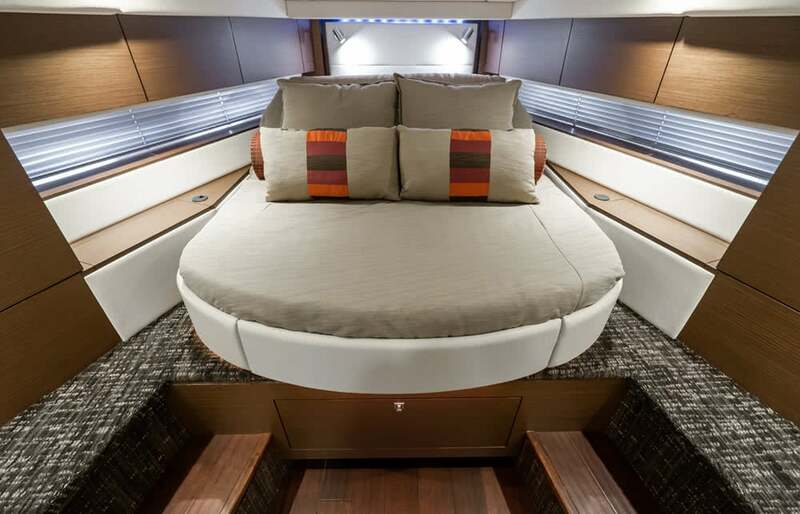 Aft there is another seating area that converts to a second sleeping berth. It too has a television. Finely finished walnut cabinetry is used throughout the interior. Portals bring in pleasing natural light. The environment is always comfortable as the yacht is equipped with air conditioning and heat, both below decks and in the cockpit. 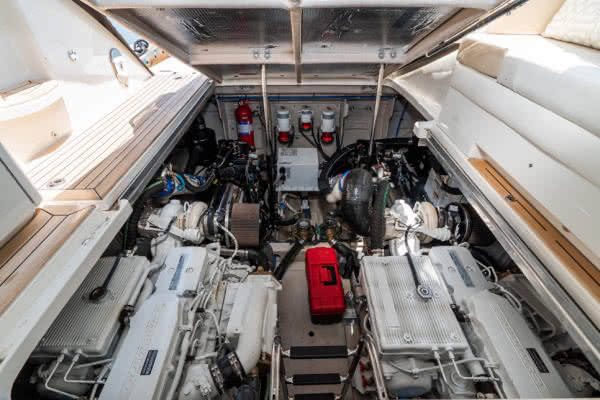 Each yacht is equipped with safety gear that exceeds Coast Guard requirements. 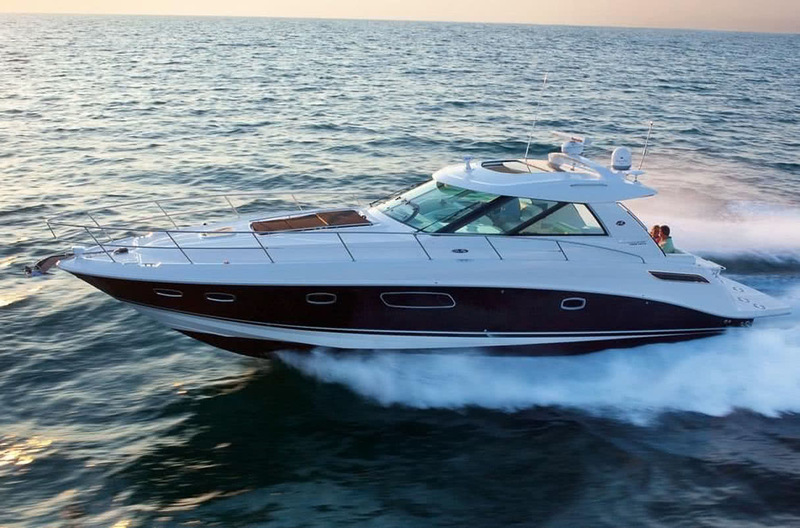 Sea Ray is renowned as the maker of the world’s most luxurious and highest quality yachts. 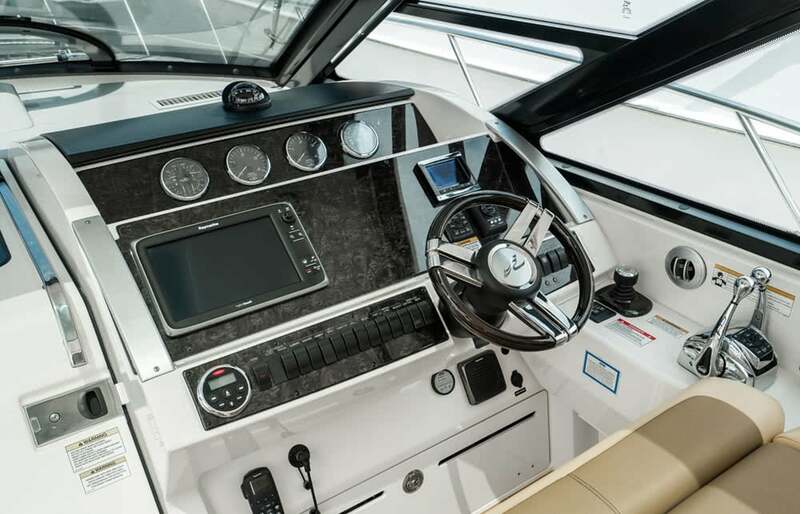 Elegant styling, robust engineering and rugged seaworthiness have made this true. 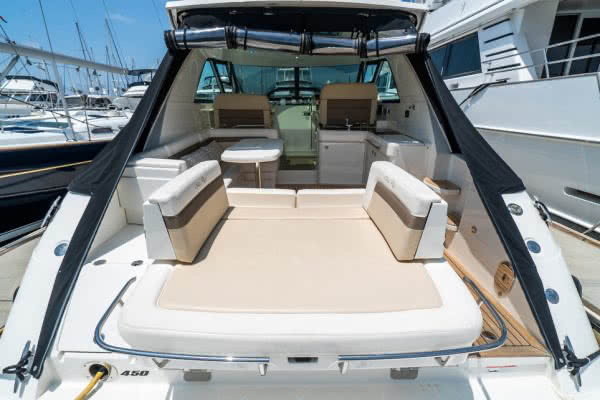 Sea Ray sets the standard by which all other yachts are judged.